Nobody knows when Bonhoeffer wrote this short essay, but it was clearly a major part of his most consistent pastoral experience. 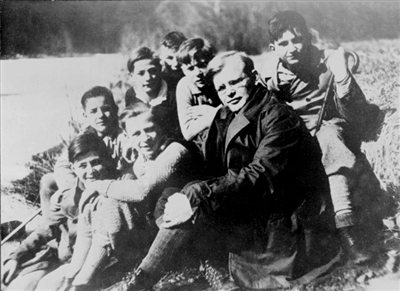 It’s hard for many to believe, but Bonhoeffer spent his entire pastoral ministry, from 1925 to 1939, with either children or youth. All of it! And he wrote these theses toward the end of that period, after years of experience with young people, and writing other theological essays and books. Bonhoeffer’s eight theses have a lot to teach Christians today, especially as we struggle to help young people hold on to their faith during the transition from adolescence to adulthood. At a time when many are concerned about the “rise of the nones” and young people “drifting away” from faith, Bonhoeffer has much wisdom to offer. And as is so often the case with Bonhoeffer, he speaks to us in surprising and unexpected ways. To keep young people in the faith, for example, many today argue that youth should have a privileged place in our churches. Young people, so the argument goes, need a place that more directly forms their identity as “Christian youth,” a place that gives them an identity that will stick during and after their time at college. Youth enjoys no special privilege in the church-community. It is to serve the church-community by hearing, learning, and practicing the word. God’s spirit in the church has nothing to do with youthful criticism of the church, the radical nature of God’s claim on human beings nothing to do with youthful radicalism, and the commandment for sanctification nothing to do with youthful impulse to better the world. Understand why I was amazed? These are strange words for us today. Ironically, the more anxious we have been about young people leaving the faith, the more we have tried to create a privileged space for them; and the more we have created such a privileged space, the more we have created avenues for them to depart from Christian commitment. Sadly, youth ministers often think a major part of our job description is to claim a special privilege for the young. But such claims do more harm than good. We only fortify the generation gap, pushing young people off into youth ministry programs and away from the center of the congregation. We make the very nature and form of childhood no longer theological but fully cultural. Because of “special privilege,” we segregate young people in their own special youth rooms and youth ministries. Youth are so “special” to the church that they become a major line item in the annual budget. But all this specialness only pushes them further from the center of the church community. Making young people “special” divides them from their parents and other adults, for only those with special knowledge can teach them the faith, or even relate to them at all. As a result, youth workers are caught in a vicious cycle. Once their pleas for “special privilege” have been heard, they often become ostracized and frustrated. They have sounded the alarm about a distinct generation gap that needs specialties and specialists to solve it. But then they find themselves and the youth far from the center of the church community’s life. Perhaps, as Bonhoeffer suggests, the best way to advocate for youth and to do youth ministry is to tell the church community that their young ones have no privileged space. Instead, young people must be taken deep into the life of the community to find Stellvertretung (place sharing) with all the adults of the community. With no more privilege than anyone else, the young should be invited into friendship at the center of the community. Together, we all bend our lives toward the unveiling of Jesus Christ in our midst. Following Bonhoeffer’s Thesis 4 would require a profound paradigm shift. Under his vision of youth ministry, the paid youth worker’s job -- her ministry to and for the young of the church -- is to remind the church that there is no privileged space for its children; its children must be taken into its life. Her vocation is not to idealize the youthful spirit of the church’s young people but to call the church to look past that spirit and embrace young people in their full humanity. To Bonhoeffer, it is theologically misguided to even put together “Christian” and “youth” as a privileged label, for Jesus is not the inventor of Christian children but of childhood universal (as Bonhoeffer asserted in a little-known lecture in Barcelona). Combining “Christian” and “youth” undercuts the importance of young people themselves. To label the young “Christian youth,” Bonhoeffer believes, is to make faith bound not in their humanity and the eschatological work of Christ, not in the wrestling of their being, but in this episodic time of “special privilege” created by culture. Faith becomes a fashion, a particular, distinct period during which you are loyal to something before moving on to something else. For years, youth ministry has been searching desperately for new ways to keep young people connected to the faith they had as “Christian youth.” Young adults seem to shake off “Christian” like a dog shakes off water after a bath. Maybe the reason that’s so easy to do is because we’ve fused “Christian” and “youth,” establishing a privileged space for “Christian youth” in our congregations. Clearly, Bonhoeffer believes that we should continue to do youth ministry. But we should do it by undercutting youth ministry as a privileged space. We should do youth ministry as way of moving the young into the center of the church community. Youth ministry seeks not to make young people “Christian youth” but to participate in the humanity of the young as they encounter the living Christ. Youth ministry is not about strategies to produce “Christian youth” that hold on to the fashion and stay loyal to the brand. Instead, it seeks to invite young people into the cruciform space of Stellvertretung (of place sharing) that is concretely lived out by the community of the church. In the privileged space, young people are “Christian youth” for a time. But in the cruciform space, they are given a shared space, a space of persons sharing in persons. They are not “Christian youth” but persons bound to others in faith, hope and love. In the shared space of church, young people encounter the living Christ, who meets them not with a call into a fashion but with an invitation to follow. Courtesy of Faith & Leadership www.faithandleadership.com. Photo courtesy German Federal Archive via Wikimedia Commons. This essay is adapted from Andrew Root’s forthcoming book, “Bonhoeffer as Youth Worker” (Baker Academic), scheduled for publication Oct. 21. The opinions are those of the author and do not necessarily reflect the policy or position of the Florida Conference.